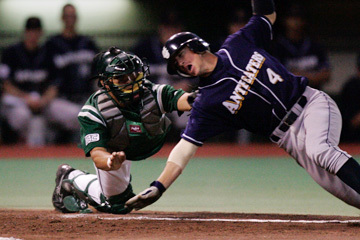 Hawaii catcher Esteban Lopez tagged UCI runner Chad Lundahl out at home plate last night at Les Murakami Stadium. Scott Gorgen baffled the Hawaii Rainbows for 8 1/3 innings last night and UC Irvine handed UH its first shutout of the season 1-0 in the second of a three-game nonconference series before 2,033 fans at Les Murakami Stadium. The Rainbows (4-2) managed just two hits off the freshman right-hander. Gorgen walked two and fanned six to win his second game of the season. "It was a great game to watch. We were just on the short end tonight," said UH coach Mike Trapasso. "Gorgen had us guessing, had us handcuffed and tonight belonged to him. Give him and the Anteaters credit." The Anteaters (4-2) scored their run in the first when the Rainbows missed a chance at an inning-ending double play. Taylor Holiday sent UH starter Ian Harrington's first pitch to the base of the left-field wall for a double. Ben Orloff sacrificed Holiday to third and, after Cody Cipriano walked, Holiday scored when UH third baseman Jon Hee misplayed Jaime Martinez's high hopper. The 'Bows had no success against Gorgen all night. Robbie Wilder walked to start the first and took second on a groundout. However, he was thrown out at the plate by Martinez after the UCI first baseman was pulled off the bag toward the outfield side by a throw from shortstop Chad Lundahl. "Robbie was on his own, but I do not fault him at all for trying to make something happen," Trapasso said. Gorgen, a freshman right-hander, limited Hawaii to singles by Eli Christensen, who was thrown out attempting to steal second, and Wilder in the third. After Wilder's hit, Gorgen retired 17 consecutive batters until he walked Wilder on a full count with one out in the ninth. Other than Wilder in the first, Gorgen did not allow another Rainbow into scoring position. "I have no idea how that guy held us to just two hits. We just didn't get the job done tonight," Hee said. Harrington, UH's left-handed starting pitcher, also fared well after giving up two more hits in the second, but escaped unscathed when Matt Inouye threw Lundahl out at the plate to end the inning. On the throw, Inouye pulled a back muscle and left the game after hitting in the bottom of the inning. Harrington allowed just three hits over the next five innings. The Anteaters got a runner to third with two outs in the third and fourth innings and to second in the seventh, but Harrington was equal to the task of preventing further UCI scoring each time. "Ian struggled early and that's when I took the trip to the mound (in the third inning). I told him we were flat and he had to control the game, hold them to one run and settle things down," Trapasso said. "Ian allowed one run in seven innings and I'll take that any day. "Tomorrow we just have to forget tonight and get our offense going again." Junior right-hander Rich Olsen replaced Harrington, who walked one and struck out three, to start the eighth. Olsen retired six of the seven batters he faced, striking out the side in the ninth. Mark Rodrigues will start for UH in today's series finale that starts at 1 p.m.
E--Lundahl, Hee, Christensen. DP--UCI 1, Hawaii 1. LOB--UCI 7, Hawaii 3. 2B--Holiday, Cipriano. SH--Orloff, Werhun. CS--Christensen. WP--Harrington 2. HBP--by Necke (Hee). Umpires--Jim LeBeau (plate), Gary Montalbo (first), Cary Izuka (third).